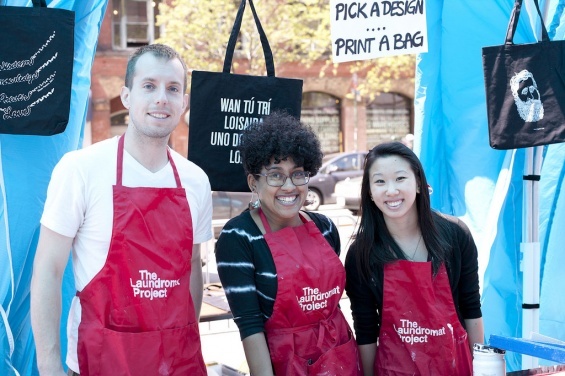 Screenprint a tote with the Laundromat Project and participate in an on-site exhibition, hands-on demos, and speed networking! artflock.org is one-stop shopping for vital professional and informational resources for multidisciplinary artists in the New York City area. It is the core project of the Alliance for Sustainable Arts Professional Practices (ASAPP) and features a comprehensive calendar of professional development event listings from around the metropolitan area as well as other vital resources. Information is compiled by the twenty-six member arts organizations. ASAPP members include A.I.R. Gallery, ALJIRA, apexart, ARTISIN, LLC, Bronx Council on the Arts, Brooklyn Art Space, Brooklyn Arts Council, Center for Book Arts, Creative Capital, Council on the Arts and Humanities for Staten Island, CUE Art Foundation, Culture Push, Dieu Donné, Elizabeth Foundation for the Arts, Harlem Arts Alliance, Laundromat Project, Long Island Arts Council at Freeport, Lower Manhattan Cultural Council, New York Foundation for the Arts, Northern Manhattan Arts Alliance, NURTUREart, Pratt Institute, Parsons – The New School for Design, Queens Council on the Arts, the Urban Artists Initiative, and Utrecht Art Supplies. Major funding for artflock is provided by the Emily Hall Tremaine Foundation, with additional support from the Joan Mitchell Foundation.